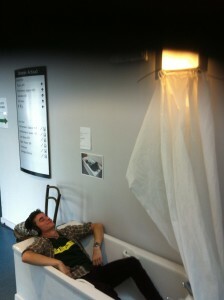 Do you put your head under the bath water? What can you hear under the bath water? Do you remember putting their head under the bath water? 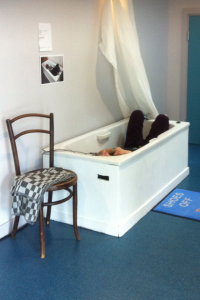 After a series of work called Through Walls, Through You – BEAM Festival – 2012, commissioned me to make a sound artwork called Through the Bath Water. 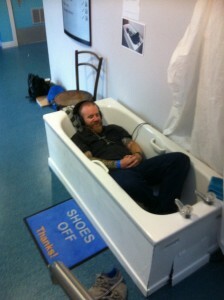 The installation involved the public, listening to sounds over and under the bathwater. 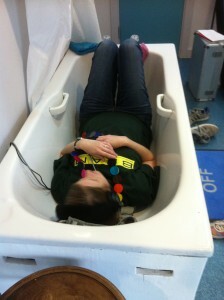 It involved actively getting into an empty bath, and putting on headphones. Through the headphones listeners heard the sounds of the bath water running and on tilting their head back to a certain angle heard the sound of the water running but from under the water. The contrasting sound of the change from over to under water reminded the listener of their own experience of: perhaps bathing as a child, plunging their heads under water to rinsing their hair of shampoo or just playing about. 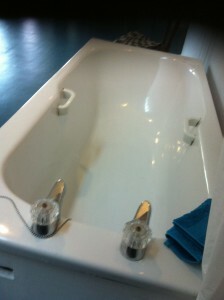 You may wonder why any one would get in this bath, but the setting was inadvertently enticing: the bath was placed in a grey corridor near an outside door, with a bath mat requesting you politely to take off your shoes. I did wonder if the mat should say ’get in!’ but people did get in and by the expression on their faces they enjoyed the experience of the situation – shoes off and all! 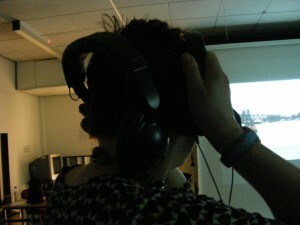 I was interested in connecting the listener with their own past experiences of hearing sound through differing materials, and the sounds being at different speeds connecting them to the underlying laws of physics that we all experience daily. I chose to concentrate on the sound to make the point of the comparison between the sound heard in air and water. I didn’t want to distract the audience from the sounds with other experiences. • humming in the room loudly and then softly. 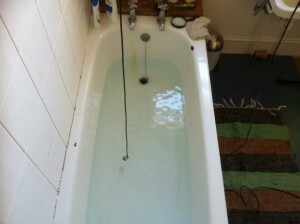 I found that as soon as there was some different element to follow other than the bath water, there became a narrative. This narrative, which was fun to conceive and create then over rode the focus on the sound itself and its behaviour, so I kept to the sound of the bath water. Sound travels faster through water than it does through air (Approximately 1482 mp/s in water as opposed to 344mp/s in air depending on the quality of both. The hydrophone under water sound, does not replicate the behaviour of our human ears listening under water. This brought up further questions about the way other mammals and fish ‘hear’ under water. I wondered if I needed to adjust the EQ on the recording to suggest it was listened to under water. I put a small amount of reverb on the over water sound to make a contrast with the under water sound. Last year I was lucky enough to catch the tour Wet Sounds by Joel Cahen, where we listened under water to the sound tracks played under water. Have a look here: http://www.wetsounds.co.uk/ It brought up questions about how ears react under water to sound and how fish and marine mammals hear sound under water? By making sure we could set up the max patch tilt for tilting forward and backward, this meant the listeners could put the head phones either way round. There was positive feed back from the ‘bathers’, but a larger number of them requested that if next time if the bath could be bigger, it would be easier to slide down to hear the under water sounds. • ‘Adjust the headphones so it doesn’t matter which way round you when you put on them on. The tilt goes both ways’. • ‘Had some sense that there was the materiality of the water there. 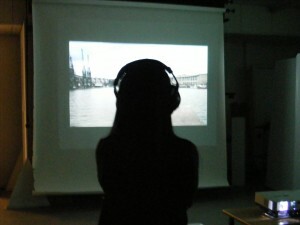 Earlier in 2012 I set up, at Oxford Brookes University, an installation in a studio showing two films. I was interested to see if the films would draw attention to our own usually subconscious reading of time, sound and distance, and if the combination of hearing the sound from the two films would emphasise this. 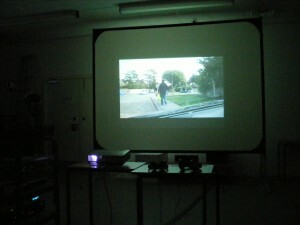 The DVDs used a 5.1 sound system to enable the two soundtracks. 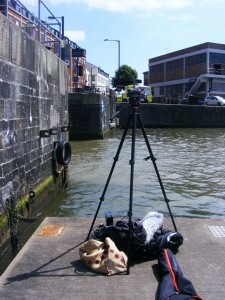 One film was shot in Bristol docks and one in a street in Oxford. 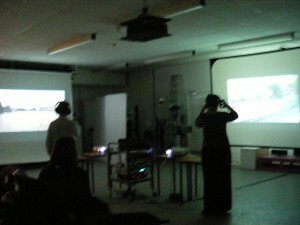 These two looped digital recordings each had two soundtracks recorded in those places: in Bristol above and below water and in Oxford above and below ground. 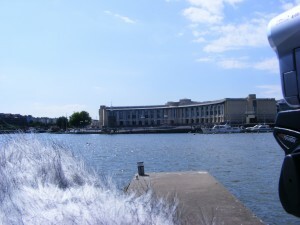 If you chose to look at the docks scene (a view of Bristol Docks) you could either hear the sound above the water or the sound below the water on head phones. The sound from the boats could be heard on the hydrophone under water as well as above the water. I used a hydrophone for the under water recordings and a long-range stereo rifle mic recording into a Fostex digital recorder. The hydrophone is about 1.5m depth off the end of the pontoon . If you chose to look at the road scene (a road outside Oxford) you could hear the sound above the road or sounds under the road in the ground. the sound of the impact of the step of the walkers below the ground (or cars or bikes), contrasted with those picked up on the mics above ground, due to the different speeds at which sound travels through ground and air. I used a pair mics (Rode NTG2) recording the over ground sound into an Edirol 44 digital recorder, and for the under ground sounds I ran the a geophone – SM24 -into a battery operated sound system in my car and recorded from another digital recorder from the subwoofer. 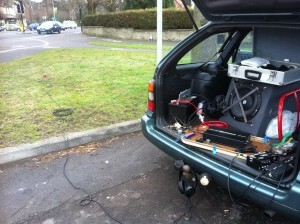 To boost the geophones signal I had a preamp and 3000W car amp and 15” sub. At the front of the car, not shown here, was a pair of mics recording over ground sounds by the front wing mirrors. Below is the scene from the end of the docks, when I made the recording, where I could hear the diesel engines of the different boats before they rounded the corner into view. I wondered if I could show this and the viewer would understand that the sound in the water was travelling faster than the sound in the air. At the time, and for both films, there were practical difficulties cueing the equipment to sync up the sound and film, getting permissions from the public when they came into shot and getting good sound levels. All of which led me to think that this would be a work in progress exercise rather than a finished product. 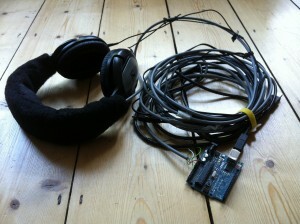 • Would you film the hydrophone and geophone? 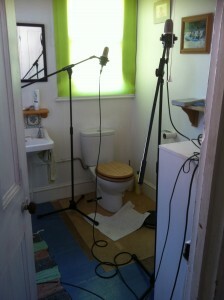 Would you film the cameras filming the shot to showing where different sounds were coming from? the listener to understand where the mics were picking up the sound. two scenes and techniques offered a complex set of visual information. Earlier on decisions were made about the presentation of the sounds the themselves, and ideas like putting them on speakers placed up high and down low, and only having the ‘under’ sounds on headphones – were tested. The whole exercise did generate ideas about how to direct listeners to listen to specific sounds. Filming and recording where time, sound and distance are key showed me some of the complexities of trying to portray the idea of ‘seeing sound’. Elements of the ideas for this presentation informed me about subsequent work and particularly isolating ways of listening to and through water in a more domestic environment. 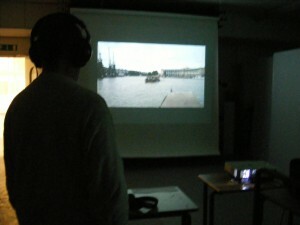 This film by Kaffe Mathews (see vimeo) shows another way of focusing on the under water world and its’ sounds. 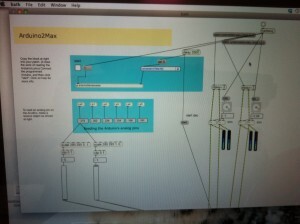 It was made in collaboration with Nenagh Watson on a theme of Ephemeral Animation.